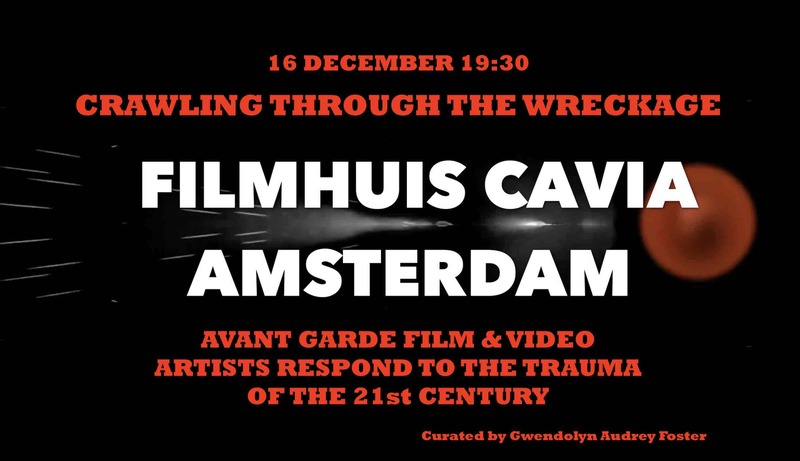 “Crawling through the Wreckage: Avant Garde Film & Video Artists Respond to the Trauma of the 21st Century,” Curated by Gwendolyn Audrey Foster at Filmhuis Cavia, Amsterdam. December 16 at 19:30. Featuring imploding blasts of eye-opening film & video art by international artists including Kasumi, Francesca Fini, Marie Craven, Gina Kamentsky, Indecline, Rhayne Vermette, Bill Domonkos, Jon Behrens, Sylvia Toy, Larry Wang, Jennifer Sharpe, Beth Holmes, Janie Geiser, Karissa Hahn, Wheeler Winston Dixon, Christina Raia, Charles Pieper, Sarah Brown, Donna Kuhn, Kim Balouch, Edward Ramsay-Morin, Eduardo Cuadrado, Isabel Chiara, Marco Coraggio and Colectivo Los ingrávidos. (Guest Curator) Gwendolyn Audrey Foster is an experimental filmmaker and author of numerous books and essays on experimental films and filmmakers, including "Experimental Cinema: The Film Reader,"" Disruptive Feminisms,"" Women Film Directors,"" The Films of Chantal Akerman," and many other works on film and cultural studies. Foster is originally from New York City and is currently Willa Cather Professor of Film Studies at the University of Nebraska.